I love using natural ways to help me get through hard times. Herbal Medicine Remedies has become my go-to solution with Essential Oils for anxiety and stress. Losing a loved one is the worst kind of pain anyone ever endures. Grief is never-ending and sometimes it just consumes you. When my mom was sick last summer and passed away before my eyes from a brain tumor I felt an emptiness that can never be filled again. I watched her pass from this life to the next and I am sure she was greeted by those that passed before her. Some people say you things don’t actually get any easier as time goes on, you just get used to the pain. You get used to missing that person day and night, each time you think of them you feel that ache from the emptiness. Each time you utter their name out loud to talk to them, tears spring to your eyes. Getting through the night is a struggle because those quiet hours when everything is still your mind is left to wander and you can’t help but think of that person you miss the most. When my mom first passed away I used xanax. It helped, though it kind of made me feel loopy. I didn’t like how I was not in control of my mental being when I took it. I also didn’t like waking up feeling groggy. Same with prozac, though that is a daily medication and I didn’t feel groggy from it but I definitely was aware that I was pumping toxins into my body, exactly from which I am trying to get away. One of my goals in 2015 is to get rid of toxins. See my other 2015 goals here. I have been searching for and talking to loved ones about herbal medicine for anxiety and stress that might help me ease some emotional stress without popping more pills. If you have a jittery moment, chamomile tea might help calm you down. Some compounds in chamomile (Matricaria recutita) bind to the same brain receptors as drugs like Valium. See my post on chamomile tea here. This is a sleep aid, for insomnia. It contains sedative compounds; the German government has approved it as a treatment for sleep problems. If you want to try it, take it in the evening—not before you go to work! Valerian is often combined with other sedative herbs such as hops, chamomile, and lemon balm. I know, we hear this all the time, but it’s true. Lately I’ve been really trying to make an effort to get on the treadmill – I am not walking outside when the temperature is below freezing! But seriously, even just walking briskly and getting my heartrate up helps with the nervous tension and irritable feelings as well as aiding my health. Yoga breathing has been shown to be effective in lowering stress and anxiety. In his bestselling 2011 book Spontaneous Happiness, Andrew Weil, MD, introduced a classic yoga breathing technique he calls the 4-7-8 breath. One reason it works is that you can’t breathe deeply and be anxious at the same time. To do the 4-7-8 breath, exhale completely through your mouth, then inhale through your nose for a count of four. Hold your breath for a count of seven. Now let it out slowly through your mouth for a count of eight. Repeat at least twice a day. Heating up your body reduces muscle tension and anxiety, research finds. Sensations of warmth may alter neural circuits that control mood, including those that affect the neurotransmitter serotonin. Warming up may be one of the ways that exercise—not to mention curling up by a fire with a cozy cup of tea—boosts mood. Adding lavender to the bath with epsom salts allow the toxins to be drawn out of the body so you feel refreshed and relaxed. Lavender is a popular bath herb because it both smells good AND is relaxing and soothing. I’m so sorry to hear you lost your Mom. I know how hard it is to lose someone – the things you described at the beginning are so accurate. I lost my Dad when I was 8, and my Uncle to cancer when I was 16. I am now 25 and I can tell you, from my own experience at least, that time does heal…. But not at first and not the way we are told to expect. The first chunk of time is just missing them and finding your “new normal”. That chunk of time is different for everyone, but once you hit a certain plateau the time starts to heal. I will always miss my Dad and my Uncle and I will always love them. The severity of that pain and heartache lessens as you accept what happened and embrace the here and now. Hold strong to your beliefs (whether it be that there is an afterlife, God, “what is meant to happen will happen”, etc) and it will get you through. Whether this helps you or not, please know that even though we don’t know each other I’m sending you and your family love and appreciate you passing on such valuable information! I love chamomile tea now and know someone who uses valerian root. I love essential oils, just have to be careful because if my cat ( apparently most are toxic to cats and apparently I’m paranoid enough to steer clear). Anyways have a great day! Oh thank you so much Keirstyn. I appreciate your words more than you know! It really helps hearing from others who have lost a parent, especially to cancer because it’s such a brutal beast and so hard to watch them go through it. Also, the oils are only toxic to your cats if they are in direct contact. I have been using them for a long time directly on my, in my cleaning products and diffusing and my kitties are just fine. I think it’s really just tea tree that is very toxic to them. I actually don’t use that except in my all purpose cleaner. Take care. Totally making the concoction for my SIL. She is struggling with anxiety and insomnia. I have everything on hand! Is this for rubbing on your body after a bath or adding it to the bath? Even the carrier oil? Crystal that’s great! I LOVE it. I use the stress relief blend (essential oils plus carrier) on my feet, wrists, and behind the ears. You could add to the bath just the oils and epsom salt (no carrier oil) and I would cut down the recipe to about 15-20 total drops. I am so sorry for your loss of your mother. 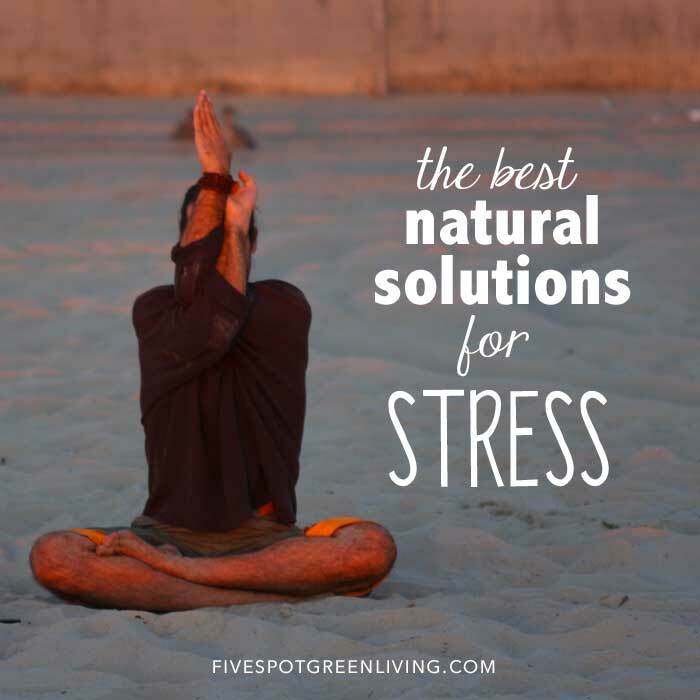 Thank you for sharing these natural remedies because sometimes in life we all need a little help but man made medicine is not always the best remedy to reach for. Carol you should definitely check out the other oils! Just make sure they are 100% pure oils like Young Living and you know the oils haven’t been mixed with chemicals or fillers. I never was a huge fan of lavender, but I like the benefits so I mix it with other oils. Hi Vicki. What is the suggested application for liquid Xanax, which may aid the body in easing stress. I so appreciate your pin, I have oils just need direction.